What is involved in doing a Business degree at the University of Winnipeg? 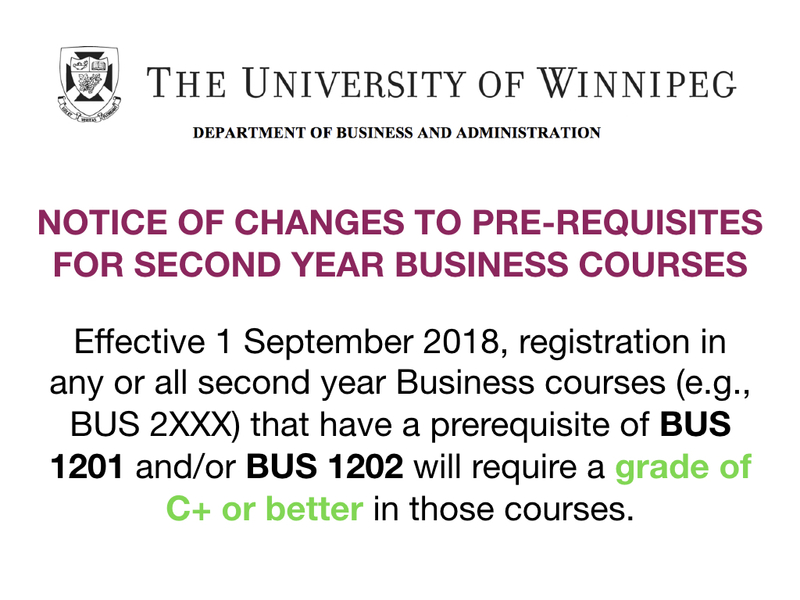 All University of Winnipeg undergraduate degrees, including a Business degree, involve meeting general requirements (set at the university level) as well as specific requirements of a particular discipline (set by Departments and/or Faculties). The specific requirements for a Business degree are set by the Department of Business and Administration. If you have decided that studying Business is the right decision for you, it is a good idea to declare your intent to undertake a Bachelor of Business Administration (BBA) degree by downloading and completing a Major Declaration Form. Finally, by declaring your intent, the Student Planning module in WebAdvisor will more accurately reflect your progress in your degree and/or requirements. The next step is to make an appointment with one of our Faculty Advisors, who will review your completed Major Declaration Form with you. Click here to view the Winter 2019 (January to April 2019) schedule for advising. The folks at Student Central will receive your form and make the necessary changes to your student record to reflect your newly-declared degree. Welcome aboard!